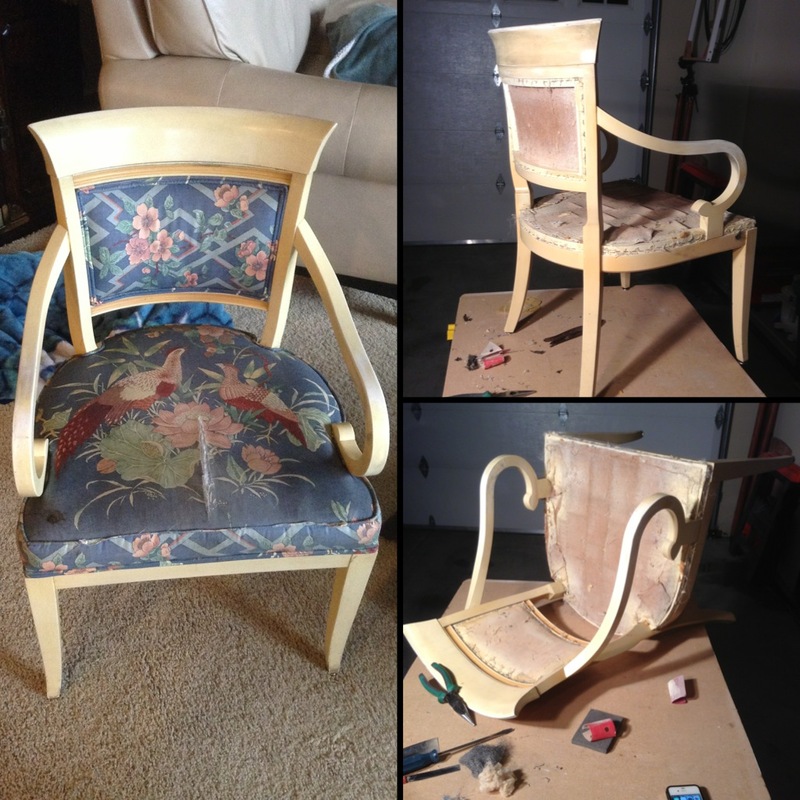 After I picked up these amazing chairs for about $100 on craigslist, the work really began. They obviously hadn’t been used in a while so I ended up not only having to rip off the existing fabric, but dispose of the foam, which had disintegrated in to powder. I then had to remove all of the staples holding it together with a pair of pliers, a flat head screwdriver and some serious elbow grease. After all of that was removed I needed to sand off the existing paint and grime. These chairs were more then likely painted last in the 1940’s, and I didn’t want to take the chance of breathing in the dust from lead based paint. If you are ever doing a project like this err on the side of caution and wear protective latex gloves, protective eye wear, and a particle respirator. You will look a bit funny but it’s worth it to avoid illness. Chairs in the midst of deconstruction. 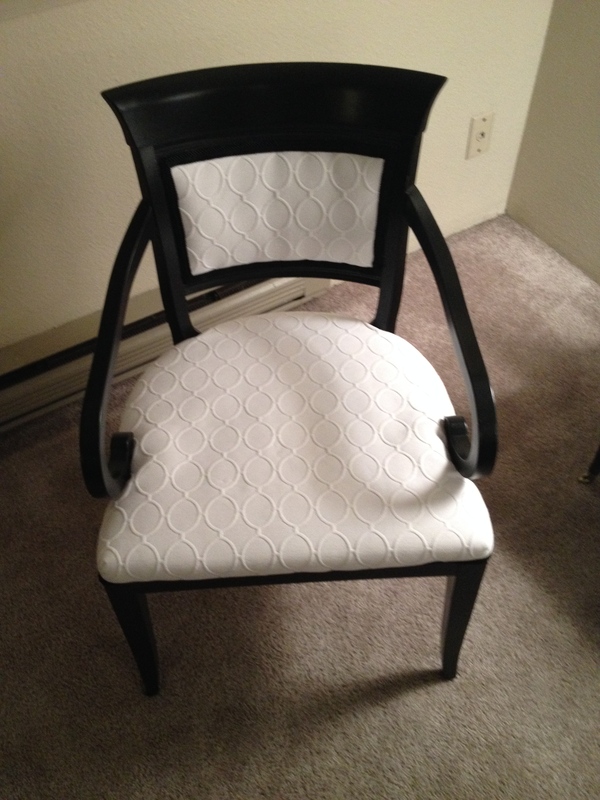 Once each chairs were sanded down, vacuumed, and wiped down with paper towels I started to paint. I chose to use a great satin finish spray paint that works on all surfaces. 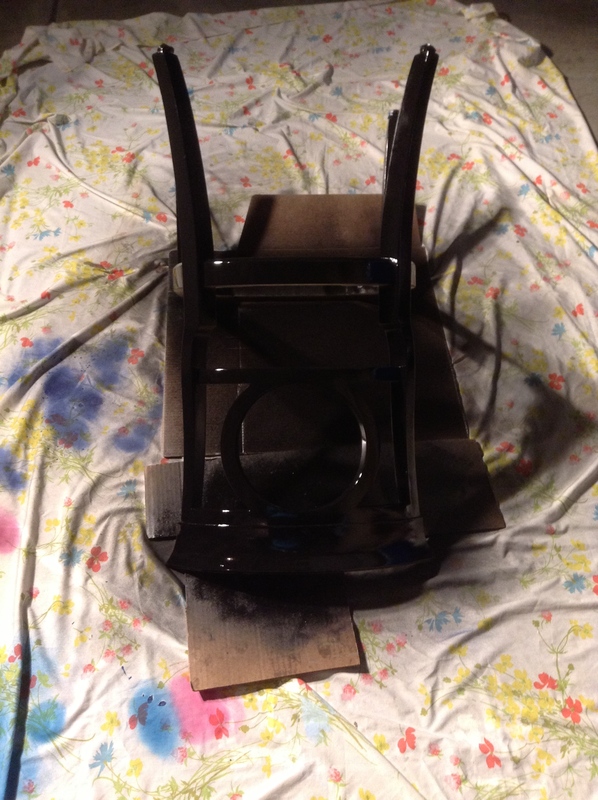 Rust-oleum was the clear choice for me with the easy use trigger. Make sure that you put a tarp down under your drop cloth so you don’t end up with paint on the garage or drive way floor. Always use spray paint in a well ventilated area and wear your safety gear! This will probably take a few coats, but make sure they dry completely in-between each coat. Once they are completely dry you can start to take care of the cushions. We used soy foam to re-do the cushions. The best way to cut this stuff is with that electric carving knife you save for Thanksgiving and then forget to use! It’s nearly impossible to use a pair of scissors or a knife without serious injury, so either invest in an electric knife or have the yardage store cut the template for you. I found that picking the fabric was one of the tricky parts for me. I know I have expensive taste on a budget that doesn’t allow for that… So I looked around at the local fabric store and found a style that I liked. Of course it was $60.00 per yard! Heart broken, I resolved to look for something less expensive. This quest eventually left me empty handed. However, I eventually managed to get my hands on the original fabric that I loved for half the price due to an upholstery sale! I ordered several yards just in case I ever needed to re-cover a stained seat. If you are crazy like me and decide to use white fabric… make sure to scotch guard it once you get your fabric shape cut out. Dark indigo blue jeans are NOT white upholstery friendly! All in all, I now have a gorgeous set of dining room chairs that I love that cost me one quarter the price of buying something brand new. 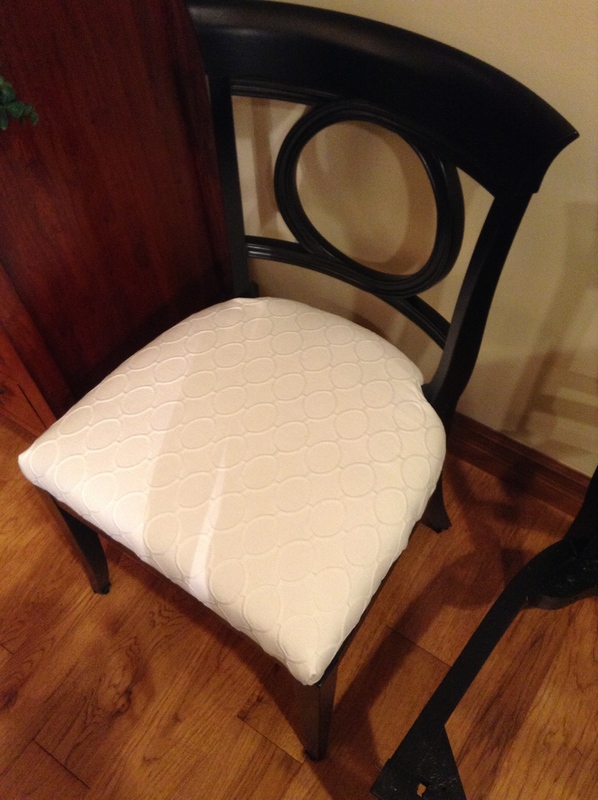 Finished chair with Robert Allen fabric! ← New Furniture On a Budget!